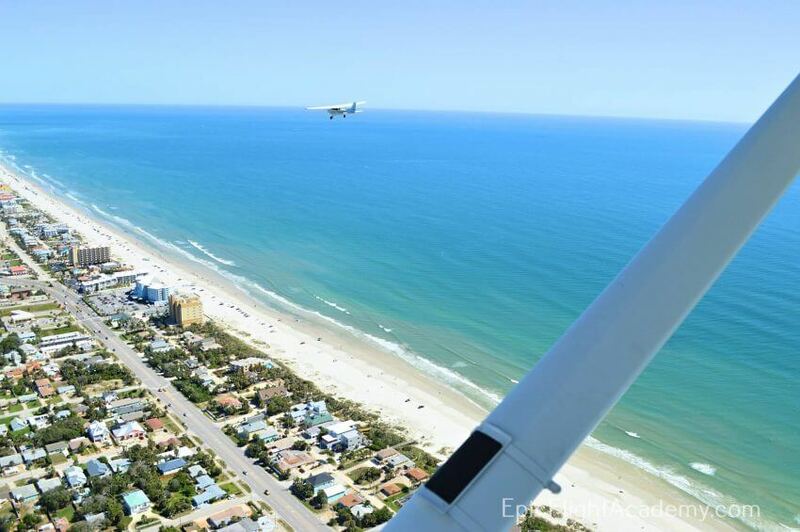 When you’re not flying over New Smyrna Beach, there are plenty of fun things to do in New Smyrna Beach! Although you’ll be plenty busy as a flight student at Epic Flight Academy, you will still have some spare time to rest, relax, and recharge your batteries. Many of our incoming students ask us about recreational things to do in New Smyrna Beach, and we can assure you that you will never be bored! If you’re wondering what to do for fun in Florida and specifically looking for things to do near New Smyrna Beach, we can help suggest everything from outdoor recreation activities to a night on the town. The Beach: First and foremost, our area is famous for its pristine beaches. You can surf, paddleboard, swim, fish, scuba dive, kayak, or do just about any water sport you can think of here in New Smyrna Beach. Many of our students simply enjoy a restful walk on the beach. Others like to take a drive along the beach, a unique privilege in this area that is not allowed on most beaches elsewhere. Whether you just want a quiet day in the sun or need to engage in some physical activity, the beach is where to go. The Movies: New Smyrna Beach boasts a state-of-the-art movie theater: AMC CLASSIC New Smyrna 12 Movie Theatre where they show a wide selection of new release films. There are also theatres nearby in Port Orange, such as Hollywood Theaters and Regal Cinemas Pavilion Stadium 14. There are matinees during the day and multiple showings in the evening, so you’ll always be able to catch a movie if you need a break from studying. Food and Drink: You will never go hungry or thirsty in New Smyrna Beach. There are restaurants on site at the airport, but if you want to get away from your school setting, you can head over to Flagler Avenue, the tourist district by the beach, or make your way to historic Canal Street. Both areas are packed with a wide range of eateries from take-away spots to fine dining. Norwood’s is the only place where you can eat in a treehouse, The Breakers is one of several restaurants overlooking the beach, and Yellow Dog Eats frequently serves up live music with its meals. There are literally dozens of unique restaurants offering delicious cuisine for every taste, many with live entertainment and dancing. Indian River Lagoon Park: This recreation area is located on Browns Bay and offers wildlife viewing, walking trails, picnic areas, and a fishing dock where you can catch your dinner. Old Fort Park: At the end of Canal Street overlooking the Indian River, this is one of the area’s most popular parks and the site of numerous outdoor annual festivals. You can explore the ruins of the fort and speculate about its origins, which remain a mystery today. Smyrna Dunes Park: This beach hot spot sits on 73 acres on the northern tip of the New Smyrna Beach peninsula. There are over 2 miles of boardwalk with views of the Indian River, Ponce Inlet, and the Atlantic Ocean. Sugar Mill Ruins: This 17-acre park includes the remnants of a 19th century coquina sugar mill that was originally part of a plantation. The sugar mill was raided during a war between the Seminole Indians and the United States, but you can still enjoy a picnic among the ruins in this peaceful setting. Seminole Rest and Trail: This 21-acre Canaveral National Seashore historic site is located just a few miles south in Oak Hill on the western shore of Mosquito Lagoon. Here you can enjoy a walk among prehistoric shell mounds dating back to 2,000 B.C. and take a break from the stress of the modern world. Arts and Culture: New Smyrna Beach is a renowned artists’ colony, and there is no shortage of talent to discover. Atlantic Center for the Arts supports music composition, visual arts, literary arts, and performing arts. Artists’ shops line famous Flagler Avenue and are tucked away in cozy spots off the beaten path. The Hub on Canal Street is home to working artists specializing in painting, sculpture, ceramics, photography, and more. Thespians at The Little Theatre have been entertaining audiences since 1947. Here you can catch a live performance of a beloved comedy, drama, or musical. And speaking of music, New Smyrna Beach’s music venues are everywhere – in bars and restaurants, at festivals and parks. If you are craving a little artistic inspiration, we’ve got you covered. Family Visits: Because our students travel from all around the world to attend flight school, they occasionally receive welcomed visits from home. Wondering what to do when your family comes to visit? As you can already see, there is a lot to do in New Smyrna Beach. But, wait – there’s more! A favorite destination with families is the Marine Discovery Center. This wildlife conservation facility includes a variety of exhibits showcasing local plants and wildlife from the Indian River Lagoon system. They also offer guided eco-tours. Families also enjoy visiting the area’s museums, such as the Mary S. Harrell Black Heritage Museum and New Smyrna Beach Museum of History. This is just a short list of suggestions based on feedback from our students and our own friends and family who enjoy the recreational aspects of New Smyrna Beach, Florida. We love our hometown and know that you will, too. We want you to make the most of your time in the Central Florida area, so when you do need some fun time away from school or when family and friends come to visit, you can enjoy historic New Smyrna Beach, world-famous Daytona Beach, and the world’s #1 tourist destination – Orlando!